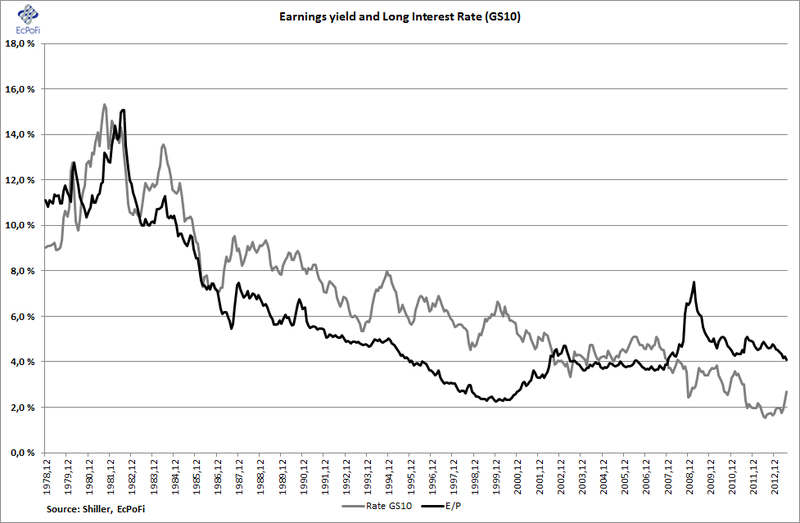 Since the previous report issued on 4th June, the S&P 500 index increased 2.68% and the 10-Year average earnings yield declined by 1.97% to 4.10% (from 4.18%). This was the lowest earnings yield reported since December 2007 when it was 3.85%. It is currently 31.00% lower than the 5.94% average since 1978. 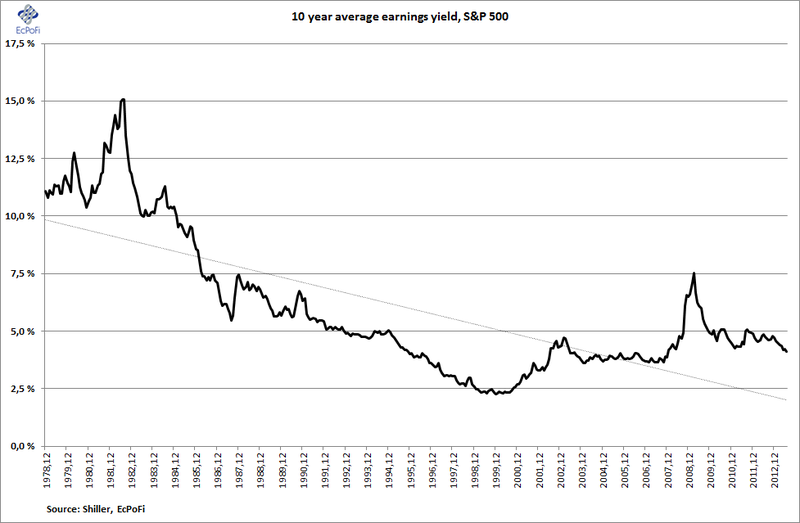 Removing the 1998-2000 period (when the market valuation was extraordinary high), the current earnings yield is 34.56% lower than the adjusted average since 1978. The market is therefore currently valuing the stock market index substantially higher than average. 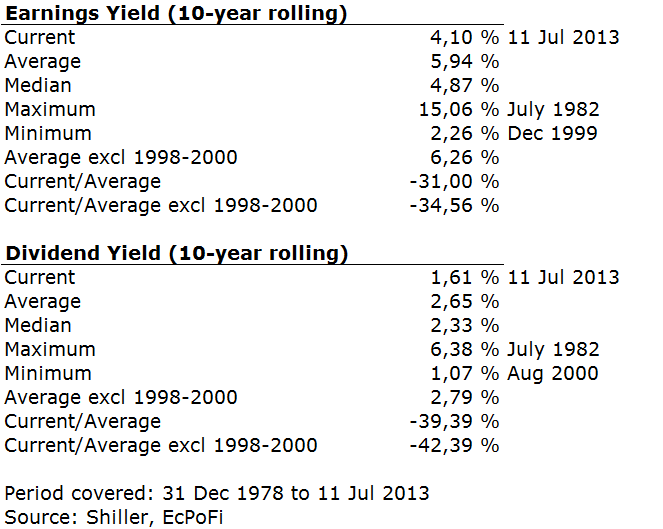 As the price of the index increased since the last report, the dividend yield dropped and at a current value of 1.61% the current yield is 39.39% lower than the average since 1978 and 42.39% lower if removing the 1998 to 2000 period. The current yield was the lowest reported since February 2008 when it hit 1.58%. As we've been reporting consistently on a monthly basis for quite some time, one likely reason for the high spread is that the Fed has been keeping interest rates artificially low. In fear of future treasury yields (and interest rates in general) rising, the stock market has hence demanded an additional spread from investing in equities. 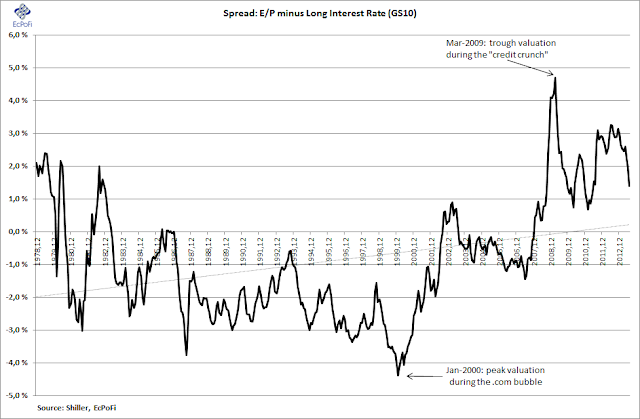 Based on recent increases in treasury yields, the market has been wise to do so. 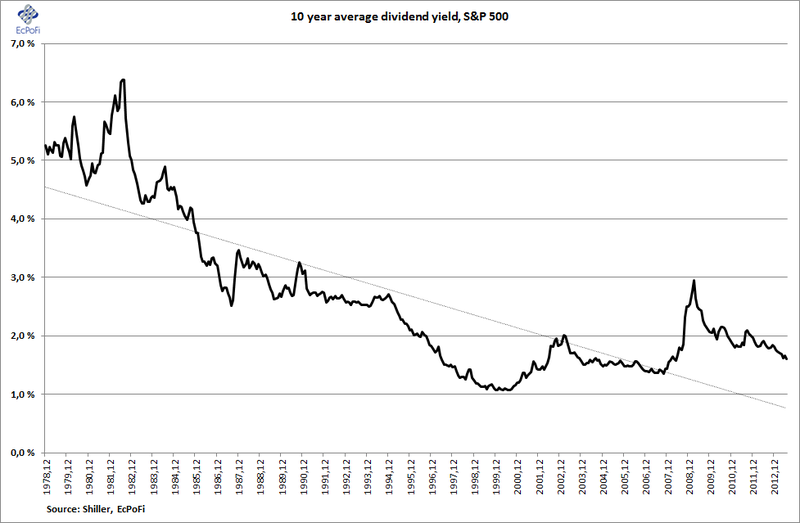 We have for some time argued (especially during the last couple of months) that the U.S. stock market has become increasingly expensive in a historical perspective based on real earnings- and dividend yields. The stock market therefore became even more expensive as of 11 July as the S&P 500 index increased 2.68% since the previous report. As we discussed last month, the more expensive the stock market becomes the lower the likely future returns (read more here). 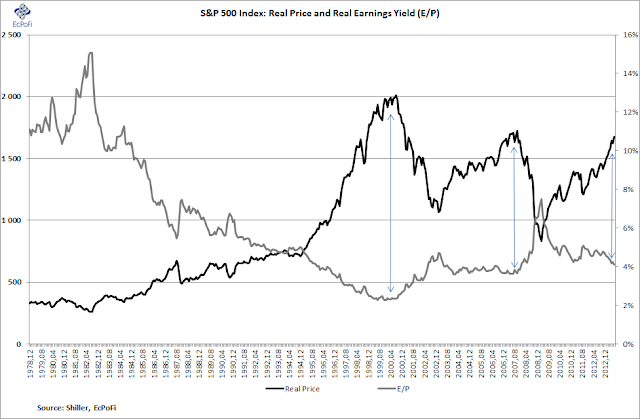 The chart below depicts real (price inflation adjusted) price of the S&P 500 index and the real earnings yield. When the gap between the two becomes significant (i.e. 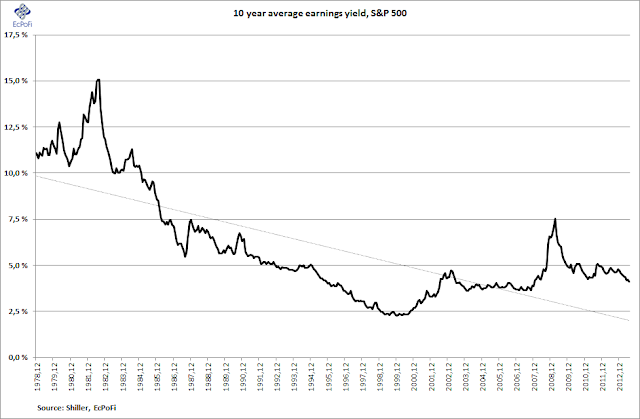 a high market valuation relative to earnings), as in 1999/2000 and 2007/2008, the price tends to drop sharply. The current gap is now starting to resemble that from 2007/2008 and as the gap widens, future returns are likely to decline accordingly.